We may be well enough into the football season to have a sense of who’s going to be grumbling in December, but it’s still hot in Alabama in September. That seems to be the general trend of things, so information about where to go to cool off while getting exercise is pretty handy stuff. Alabama has more than 132,000 miles of streams and rivers. We have more types of plants and animals living in them than any other state in the nation. It’s one of the things our state ought to be proud of. But on a hot Sunday in September, it’s kind of surprisingly hard to find a place to splash around a little bit. First we tried Holy Ground Battlefield Park, near Lowndesboro. Our taxpayer-funded State Department of Tourism mentions it on its site. We were going to swim, not for the massacre that happened there in 1813, but if there had been some kind of cool plaque where William Weatherford jumped his horse off a cliff under a hail of bullets, that would have been cool to see too. The site of the Battle of Econochaca may or may not currently be on the Alabama Register of Landmarks and Heritage. 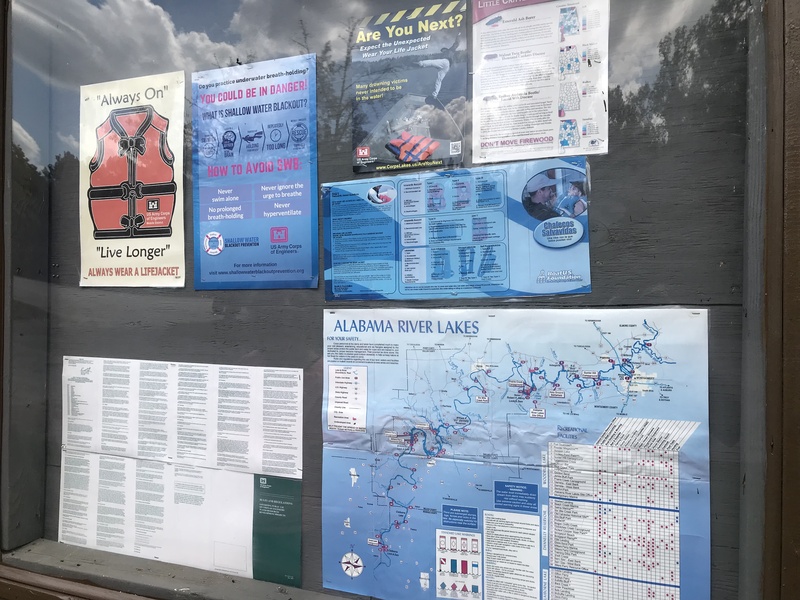 The Historical Commission’s website is too confusing to navigate to find out, but the point is that we were just trying to go swimming at the property that is allegedly maintained by our taxpayer-funded U.S. Army Corps of Engineers. 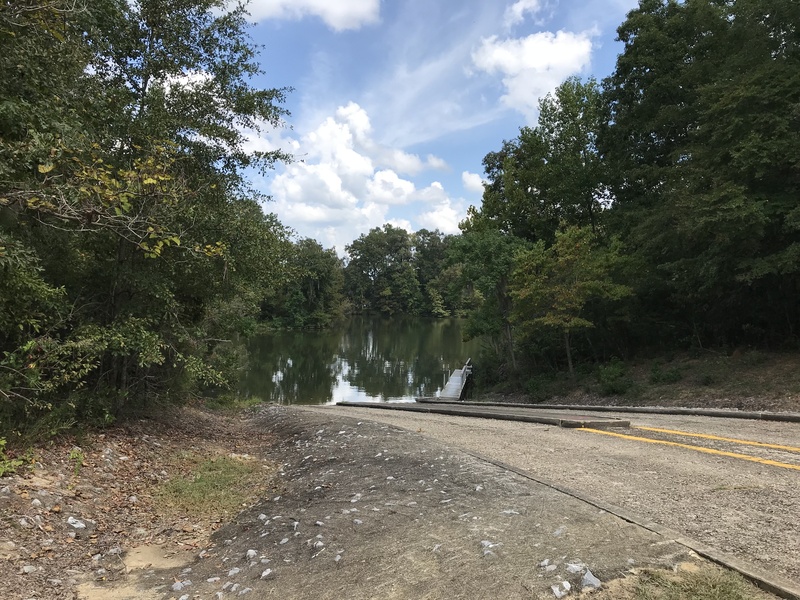 The access road to the swimming part of the river was closed and locked on this Sunday in September, so we thought we’d drive down the boat ramp portion of the road to learn more. There, we met a couple of folks who had been told to leave, that they weren’t allowed to fish from the banks of the river. We didn’t have a boat, and we didn’t want to picnic and swim in a boat ramp, and we didn’t want to be bothered by whoever told the fishing couple that they had to leave. So we left. Maybe “closed for the season” happens on Labor Day, no matter how nice of a day it is at a property that our tax money goes to maintain. It’s evidently also a nice place to see birds. This strange video has some nice overhead shots of the area if you can make it past the soundtrack. So we decided to try Gunter Hill, which is one of six campsites that are part of the Alabama River Lakes program run by the U.S. Army Corps of Engineers. There are plenty of campsites, and it’s evidently $5 for non-camping visitors, according to this website. But we were told at the gatehouse that there was no river swimming there either. And it just reminded me of the 2014 blogpost we wrote about trying to figure out the city’s relationship to the river on which it was built. Talk then pivoted to available swimming pools, but obviously that’s not quite the same as swimming in a lake or a river. The city is lucky to have the Gunter Pool (and Houston Hill, McIntyre, Sheridan Heights, and the Therapeutic Recreation Center), and some YMCAs have pools for members. But on this hot day in September, hearts set on the outdoors, we went home dry. I was so upset when “Jenkins Creek” closed. It was a beautiful piece of private land on the Tallapoosa River located on Wares Ferry Road on the left past Dozier Rd and before you get to the train tracks. So, this lovely area could be accessed by the general public (but few knew about it) for, I believe, $10/person per day. This price gave you access to fish several well stocked ponds, swim in a calm and gorgeous bend in the Tallapoosa river, and I think they were even developing other activities such as a paintball course! I’m not sure what happened ( I heard the old man who owned it died maybe) but we saw the gate was closed and the land was for sale about 2 years ago. My family was majorly bummed about it. Someone should look into if the land was sold and to whom. From the gate on Wates Ferry, it looks overgrown like no one ever bought it or something of the sort. Anyway, just thought I’d mention it as we so enjoyed the beautiful scenery, swimming and fishing!